Available June 2008. The Sanus LC1A-B1 VisionMount Tilt & Swivel Ceiling Mount is a tilt and swivel ceiling mount for large flat-panel TVs and is a great choice for space-saving corner placement or when wall mounting is not an option. 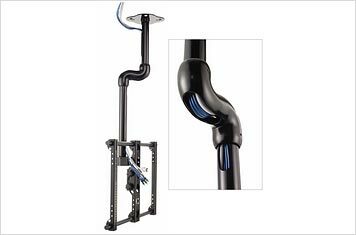 Sanus Systems' Virtual Axis technology allows the Sanus LC1A-B1 VisionMount Tilt & Swivel Ceiling Mount for Large Flat-Panel TVs to tilt up and down with the touch of a finger, and a unique wire management channel conceals and routes cables from ceiling to TV. The Sanus LC1A-B1 VisionMount Tilt & Swivel Ceiling Mount for Large Flat-Panel TVs includes ceiling adapter plates for wood joist or solid surface ceilings as well as two pipe lengths for multiple configurations. 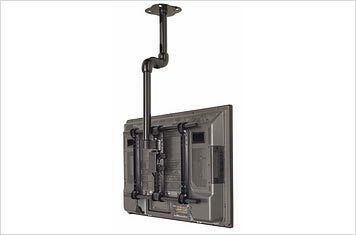 Universal mounting brackets included with the Sanus LC1A-B1 VisionMount Tilt & Swivel Ceiling Mount for Large Flat-Panel TVs fit virtually any flat-panel TV from 30 to 55 inches and up to 350 pounds. Extension Range: 10.25" - 0"
Sanus Systems manufactures a broad variety of sleek, quality AV interior furnishings, wall mounts and accessories. Sanus's high-test, acoustically superior TV stands, audio racks, and tv mounts are designed for style and engineered to perform. It is the delicate union of form and function that becomes a reality in the broad variety of audio, video and home theater furnishings from Sanus that will satisfy even the most demanding A/V enthusiast or interior designer.